Milk thistle is a heady, spiny plant with white-veined leaves and purple flowers. The seed of the milk thistle plant is commonly used to treat chronic inflammatory liver disorders and it is among the top-selling medicinal herbs. 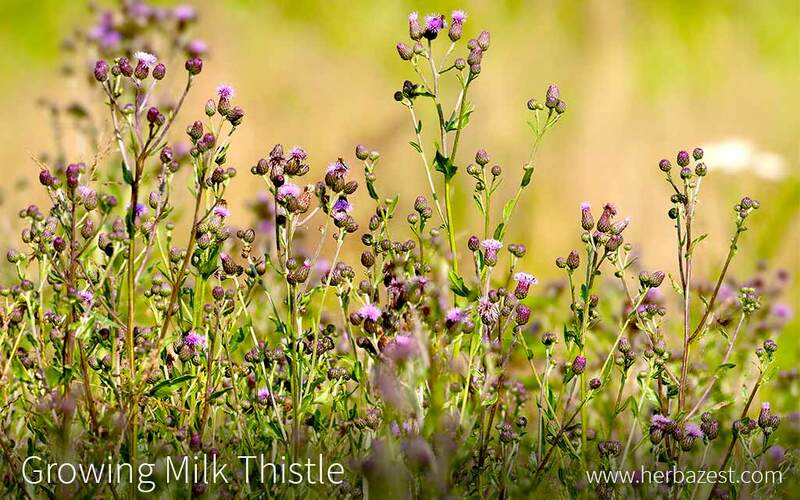 While milk thistle products are easy to come by, this is a great herb to grow at home. It requires very little care and a controlled environment to prevent invasive growth. Originated in Europe but also present in North America, milk thistle is a hardy annual plant that can be found growing wild in rocky, dry areas. It is often considered as an invasive weed; however, due to its benefits for liver health, milk thistle has become widely popular and nowadays is a common addition to many gardens and backyards. The following growing guidelines offer valuable advise about how to cultivate and take care of milk thistle at home. Milk thistle is a hardy plant that grows well in different environments, but it prefers high temperatures and dry conditions. The only requirement for milk thistle is a well-draining soil. To grow milk thistle outdoors, spread the seed directly over the desired area in the spring or fall. Milk thistle seeds only take two weeks to germinate. Since it grows in clumps, it is recommendable to space the plant 12-15 inches (30-38 cm) apart. Milk thistle is a very drought tolerant plant and prefers dry conditions. It should not be necessary to water milk thistle unless there are very extreme conditions of drought. If you wish to increase the seed production of milk thistle, you can fertilize this plant with nitrogen and potassium. However, that is rarely necessary because milk thistle is a hardy plant that thrives in poor soils. If left unattended, milk thistle can become a very invasive weed. Milk thistle itself is often considered a weed. In order to control its spread it is advised to harvest the seeds before they become over-mature. To prevent re-seeding, it is recommended to mulch around the plant. However, milk thistle competes well with other plants, so a bit of light cultivation, especially when the plant is young, should suffice to control overgrowth. There are no significant pests or diseases that are known to affect milk thistle. The seeds are the main part of the milk thistle plant that are harvested for use. Mature seeds are ideal because of their high levels of silymarin. You will know which seeds are the most mature because they turn brown and are protected by the pappus, a circle of hairs formed from the modified calyx that appears as silvery white fluff. This particular form is found on the seeds of plants in the Asteraceae family, such as dandelion and thistle. The pappus assists in the dispersal of the seeds by wind, acting as a parachute. When the flower have finished blooming and it is loaded with seeds, the flower head must be cut with less than one inch (2.5 cm) of stem. This operation can also be done by hand, in which case it is necessary to wear thick clothing and gloves since the plant has many very sharp thorns. Once harvested, the fluffy pappus should be removed from the seeds. Next, the seeds should be dried in a warm, dry, well-ventilated area. Afterwards, they can be stored in an airtight container. Most typically, milk thistle seeds are dried and powdered, then dissolved in 95% ethyl alcohol to create a tincture. This tincture generally has a bright yellow color due to the presence of the silymarin.